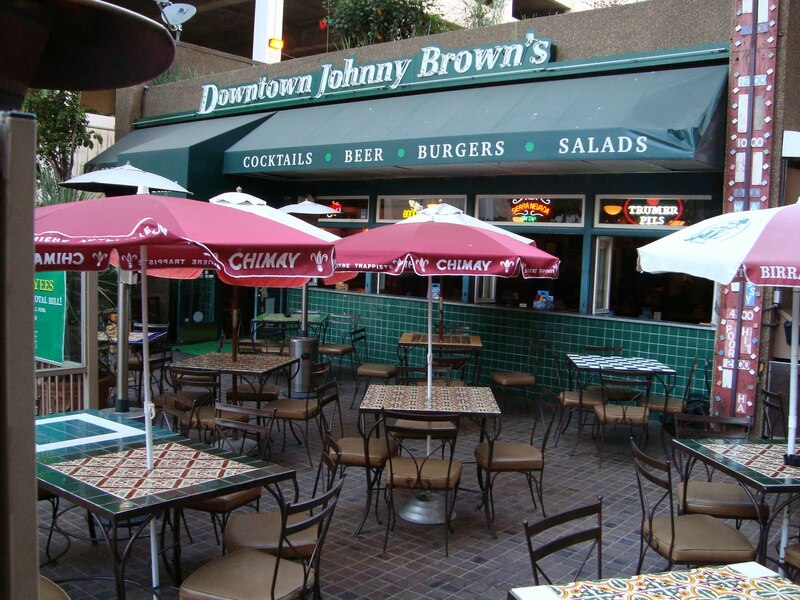 The first thing you need to know when going to Downtown Johnny Brown’s in San Diego is the place is hard to find. It’s inside the San Diego Civic Center Concourse and not visible from the street. The first time I tried to go there, I walked back and forth two or three times, trying to find it based on the street addresses which seemed to skip a few numbers, before I finally poked my head inside the concourse and found it. The dark interior looks a little like a British pub crossed between an American Sports Bar. The walls are full of light, wooden framed pictures of San Diego sports starts and pictures of what look to be patrons of the place over the years. It’s a neighborhood look other establishments try to manufacture, but here, it’s grown organically for twenty years to create it’s own unique character. 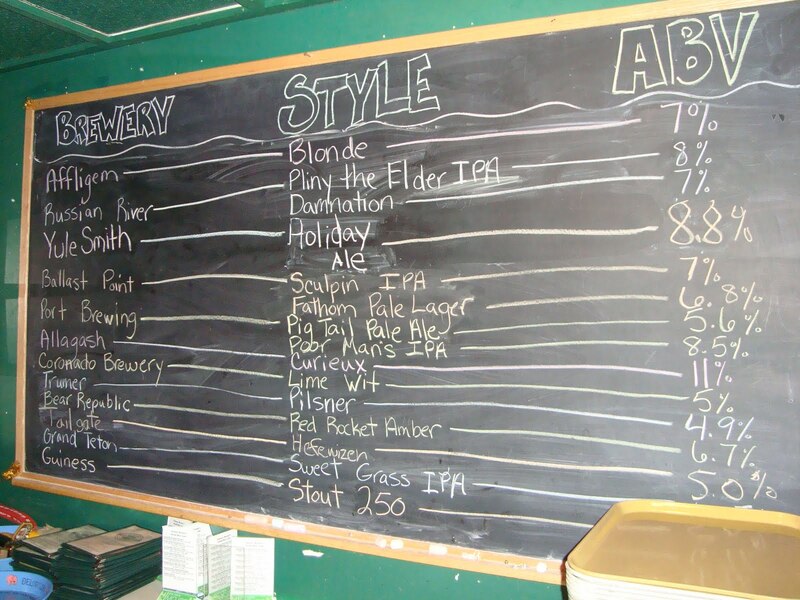 The tap list it highly loyal to the local craft brewing scene, with San Diego area breweries dominating the list. Is Downtown Johnny Brown’s on a quest to support its local breweries? Is it trying to reduce their carbon footprint? Perhaps. But Todd Alexander, who owns Downtown Johnny Brown’s, seems more driven by common sense, than anything else. “…why waste the energy and money on shipping a keg 7000 miles?” he asks. Good question. I found out how much thought goes into the tap list after contacting Todd before my most recent visit and asking how he comes decides which beers to fill his seventeen taps. Expecting a two or three sentence answer, he responded with a paragraph long, complex formula on his decision process. “….in terms of how I go about putting together my tap list, I have a few general rules and then I fill in the blanks from there. I always try and have 8-12 local beers. Now we only have 17 taps so that is where I start. I love Belgium beers, but I tend to put domestic versions of the styles on first and I almost never have more than one import. To me when I consider how great beers are here in America in general, and in San Diego in particular, why waste the energy and money on shipping a keg 7000 miles?…..although we do carry some imports. I try and have 4-5 IPAs, one Pilsner, one hefeweizen, and one high abv. Belgium style and at least one stout and/or porter. In that mix of 9 beers usually everyone will find something they like. Currently I am trying to keep 30th St Pale Ale from Green Flash on tap at all times for two reasons; one I love it, two I like to keep one Pale Ale on at all times. Now that’s 10 of my 17 taps. We also participate in Sierra Nevada’s specialty program. In order to do that they want us to keep one of their beers on. So that’s 11 of 17. From there, I try to keep a balance, maybe an amber and a nut brown…..gateway beers for people that are not craft aware. That leaves me room for something special, like a sour.” Whew! When I finally met Todd, he’s sitting at the bar, chatting away with the bar tenders and the customers like one of the many locals that frequent the place. Once he sees me taking out a scrap of paper to write down notes on the first beer I try, he probably figures this guy he’s never seen before scribbling down notes is probably the person who contacted him by e-mail about a strange beer-running blog he’s writing, he moves over to take a look. I figure out this guy moving over to check me out is Todd Alexander, and I’m right. He seems eager to tell me his story, and it soon becomes obvious why. The concept of someone starting at the bottom and working themselves all the way to the top is such an American cliche’, we forget it sometimes actually happens. Todd Alexander is such an example. He started in the middle 80’s as a busboy when the John Brown owned the place, and then graduated to tending bar. During John Brown’s ownership, the place developed a reputation for introducing new beers from the growing local craft beer scene, but when John Brown moved down to Mexico about eight years ago, that momentum seemed to stall. After about four years of this, Todd was down in Mexico visiting his boss, when John asked if he wanted to buy the bar he founded. 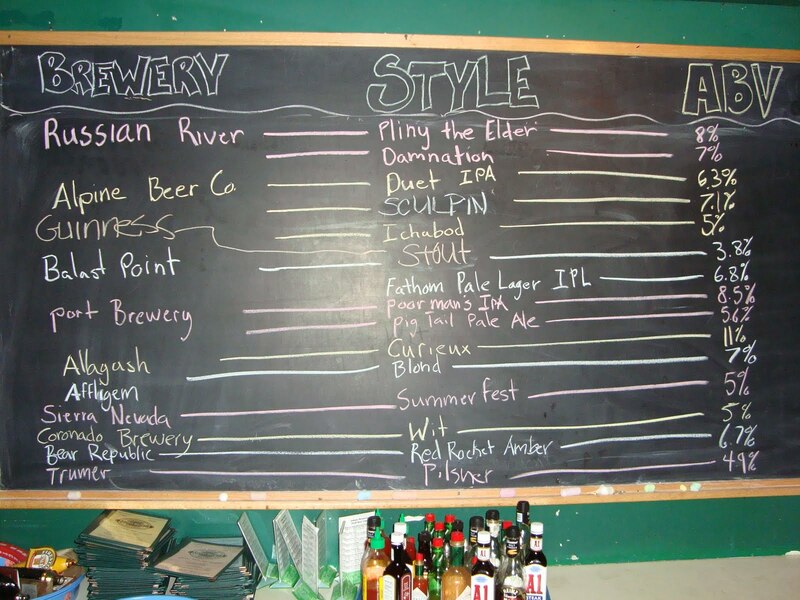 Todd took the opportunity, and over that time, has broadened the range of beers the place offers. It seems exactly where Todd wants to be. Chatting behind the bar, talking shop with his bartenders, and figuring out the next beer to put on tap. Take the extra time to find this hidden place, a few blocks away from the touristy Gaslamp District in downtown San Diego, and you won”t be disappointed. Sour lime dominates the slight yeastiness of this Wit beer, which has a bitter lime peel finish. I prefer my Wit a little lighter and more subtle, but an interesting San Diego culinary take on the Belgian style, which is starting to become over-exposed and tired. I found this IPA to be quite refreshing with it’s light amount of malt, and a crisp, astringent hop bitterness. It’s light for an IPA, but the hop crispness doesn’t make it seem watery. A pilsner on steroids? I found this to be a fresh, complex Pale Ale with a little caramel and fruitiness to it, and a strong, astringent hops finish. hmmm… a pilsner on steroids- I would like to try that!